The other day I was on my way to the crawl space door (to continue the plumbing work required to move the toilet so there's space to add a bathtub where before there was only a shower) when I heard Violet barking rather ferociously. I was concerned because it was coming from the north side of the property, and our neighbour on that side had mentioned some dogs had been harassing her horses. We didn't think it was Violet because she normally doesn't head that way. I watched for a while. Violet was beside herself trying to find a way up. 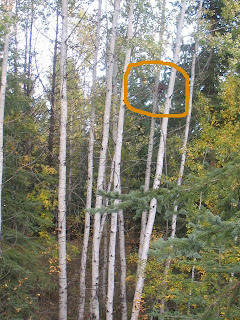 While she was looking away, the cat jumped to an adjacent spruce. I left after this, and about an hour later Violet came back to the house. I have no idea how the cat got past her. Wow! That is so cool. It's really rare to see a lynx in the wild.